Home Basketball Causeur: "They will try to hit us, this is what happens before the PAO"
Causeur: "They will try to hit us, this is what happens before the PAO"
The guard said that Panathinaikos will come with "desire for revenge", but he trusts Madrid: "We have everything to win against any team." A Fabien Causeur likes big challenges, such as the Euroleague quarterfinal playoff that starts on Wednesday against Panathinaikos (21:15, Movistar + Deportes). "I'm going to enter the track with great enthusiasm because I love these moments, the pressure of the eliminatory," he explains. 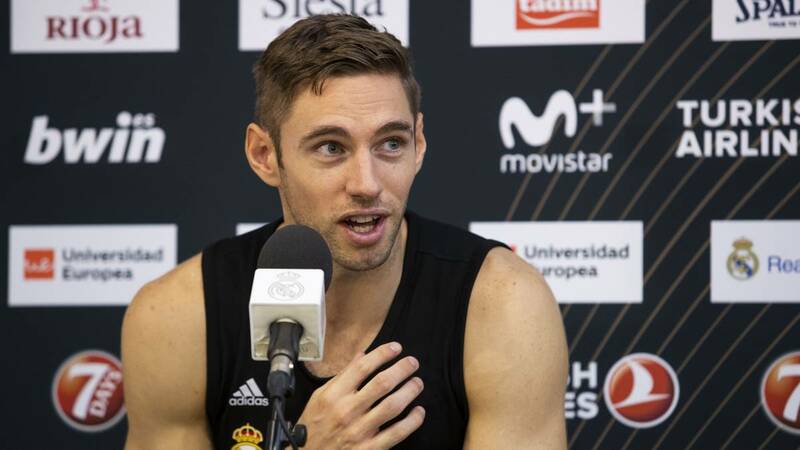 He claims to have "no idea" if he will play base for the absence of Llull and shows great confidence in the team: "We arrived well, we have many weapons. The most important thing is to focus on our game because we have everything to win at any rival. They will come hungry and ambitious and they will try to hit us, we know what happens before the Panathinaikos every time ". Regarding the support of the public, he does not hesitate: "We want the pavilion to be full, but that is going to happen, also because of our game and the ambition that we show in each game" . The tie and how is the team. "It is one of the key moments of the season, the most important, everything that happened before is almost a warm up, now comes what really counts, which will decide whether our season is good or not. I see the team very well, although we lack Llull. We have many weapons and we have shown that we can do it. We face Panathinaikos again and I imagine that they will want revenge ". The fans." Almost no need to say anything, they will support us from the beginning and to the end. We want the pavilion to be full, but that is going to happen, also because of our game and our ambition in each match. " The precedents against Panathinaikos." We have to keep what we can do well, but the most important is Focus on our game because we have everything to beat any team. They will come hungry and very ambitious and they will try to hit us, we know what happens to Panathinaikos every time. The team is ready, it was obvious on Sunday against Obradoiro that we wanted to play this game because we are focused on a key moment. " Nick Calathes." It's one of the best bases in Europe, it's incredible and you have to try to limit it, because stopping a player a hundred percent is impossible. It generates a lot of play and is key for his teammates. " Actuación individual." Each match will be a different story. I am going to enter the track with great enthusiasm because I love these moments, the pressure of the playoffs, then we will see in each game how things turn out. " Play base? " Laso reads the game every minute and we have to be prepared to do well, what worries me most is to be ready. We will see if base game, no idea ". The fire of Notre Dame." It is a disaster for the French, because it is a historical monument and it hurts a lot to see the cathedral like that and not be able to do anything. And not only in France, because it is a great image in the whole world ".